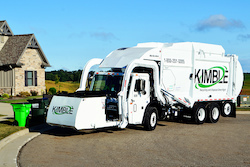 At Kimble, we’re committed to minimizing our environmental impact, while providing sustainable waste management and recycling solutions. The majority of our truck fleet is powered by clean-burning, compressed natural gas (CNG), which operates more quietly and more efficiently when compared to traditional diesel trucks. CNG vehicles dramatically reduce carbon emissions. In fact, replacing one diesel truck with one CNG truck is the CO2 equivalent of removing 324 cars from the road. To power our fleet, we operate three CNG fueling stations, located in Stark, Summit and Tuscarawas County. Our investment in CNG fueling and trucks helps to reduce our dependency on foreign oil by utilizing Ohio’s natural gas resources. Looking toward the future, we’re taking substantial steps to reduce greenhouse gas emissions and create a new green energy resource. At the Kimble landfill, we’ve installed methane wells to collect bio-gas, a renewable energy source derived from the decomposition of organic waste. We’re currently evaluating the use of this bio-gas to supplement our fuel for the company's CNG trucks.